Sailing to multiple islands on a Caribbean family vacation sounds like something for the yacht club crowd, but it's not hard to do on a resort vacation in the British Virgin Islands. It's all about picking the right spot. If your family's recipe for a great vacation includes incredible beaches, family-friendly accommodations and activities - with a side of adventurous exploration, Long Bay Beach Resort & Villas on the lush island of Tortola is just the place to go. Located on a 52-acre hillside estate on the western end of the island, Long Bay Beach Resort fronts one of the British Virgin Islands' most spectacular beaches. Long Bay's stunning mile-long stretch of silky white sand is a picture-perfect place for families to relax and make vacation memories together. Accommodations here range from oceanview and beachfront rooms to luxurious estate homes and villas - most with gorgeous views of the sea and neighboring islands. Parents of little ones can savor the tropical breezes and ocean views from their balconies while their children nap. For families looking for a bit more activity, the resort offers tennis courts, a large swimming pool, well-equipped fitness center, a scuba diving outlet, tour and rental car companies, and a complete spa with a wealth of packages and treatments. Families can take their pick from the resort's EP and all-inclusive dining plans. The informal beachfront 1748 Restaurant, located on the ground floor of a renovated 18th century sugar mill, serves breakfast, lunch and dinner. It's a lovely spot for family dinners or a romantic parent's night out, and Long Bay can arrange for babysitters as desired. Upstairs, Pasta House provides an intimate dining experience complete with Italian cuisine and lovely ocean views. Families will enjoy spending their days building sandcastles on the beach and enjoying the resort's hillside pool. The Pelican Swim-Up Pool Bar is a great place to enjoy delicious sandwiches and burgers for lunch. Nearby, the Palm Terrace Bar has a game room with a pool table, board games and a library. It's easy to spend all your vacation time enjoying the resort, but Long Bay is also ideal to use as a home base for exploring Tortola and its surrounding islands. 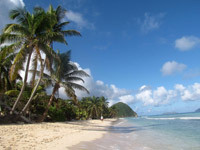 The resort's on-site car rental companies offer SUVs that are perfect for exploring Tortola's many beaches, including Cane Garden Bay Beach and Smuggler's Cove. The crescent-shaped white sandy beach at Smuggler's Cove is gorgeous and swimming here is marvelous. The road from Long Bay to Smuggler's Cove can be a bit treacherous, but inexpensive taxi service is available as well. Nearby dining options, including the casual Jolly Roger Inn, are good choices for nights out. Shopaholics will enjoy browsing the many shops and boutiques in Road Town and at the Sopers Hole Marina. Private ferry services make island hopping easy from Long Bay Resort. Several ferry companies provide inexpensive daily transportation between Tortola's West End and the U.S. Virgin Islands, including St. Thomas and St. John. Regular service is also available from Tortola to other British Virgin Islands such as Virgin Gorda (home of The Baths � a popular snorkeling destination,) Jost Van Dyke and Anegada, one of the most unspoiled islands in the Caribbean. On one of our vacation days at Long Bay Beach Resort, we took the early morning New Horizon ferry from the West End to Jost Van Dyke's Great Harbour, a favorite with yachties. A quick taxi ride brought us to spectacular White Bay Beach, home of the tiny Sandcastle resort and its well-known Soggy Dollar Bar. Aptly decorated with dollar bills (some formerly soggy) brought in by sailors who swam ashore, this bar birthplace of the BVI's most famous drink � the Painkiller. This laid back little slice of paradise looks like something straight out of a Jimmy Buffet song. Free beach chairs and hammocks are available for families who want to relax on the beach with fruit smoothies and drinks, and perhaps have lunch. The long pristine stretch of sand and excellent snorkeling make this a popular spot with boaters and the anchorage filled up quickly while we were there. Of course, a trip to Jost Van Dyke wouldn't be complete without a visit to world famous Foxy's Bar & Restaurant � a legend throughout the Caribbean. Shaded by palm trees, this quintessential tropical beach bar is made from old driftwood and decorated with personal items brought be visitors, including license plates, business cards, t-shirts and the like. While Foxy's is "the place to be" for New Year's Eve in the BVI, it's a great place to visit every day of the year. We stopped by for some ribs and were lucky enough to meet Foxy Callwood himself, who serenaded us with a humorous calypso song about our hometown (which he knew well!) and autographs. T-shirts and a wide variety of Foxy's memorabilia are available for sale. Dolphin encounters are often another "must-do" on the list of family adventures in Tortola. Dolphin Discovery offers a variety of dolphin encounter and swim experiences at their facility near Prospect Reef. Dolphin Discovery Tortola has specially designed activities for adults and kids of all ages. Children as young as one-year old can be accommodated, but kids must be at least 2' 11" to fully participate in any of the programs. This part of the Caribbean has some of the best beaches in the world - and Long Bay Beach Resort is the perfect spot to sample them. Plan to spend at least a week here. You'll need that much time to sample just enough of what Long Bay has to offer. Believe me, after a few days at this family-friendly property, it will be hard to tear yourselves away. For more information about Long Bay Beach Resort & Villas, visit www.longbay.com or contact your favorite travel agent. Rates at Long Bay are highest from the December holiday period through late April and much lower during the rest of the year. Excellent low season rates and package deals are offered during the off-season. Make sure to check the resort's website for specials. Flights to St. Thomas, USVI are often less expensive than those directly to Tortola. Check out both options before booking. We found it to be quite easy to fly into St. Thomas and take the ferry to the island. Ferry service information and schedules are available at http://www.bestofbvi.com/info/info_bviferry.htm. Renting a car on Tortola is a fun way to explore the island and access local ferries. Study a map before you leave and note nearby gas stations, as there are relatively few on the island. There are two car rental companies located at Long Bay - renting a SUV is highly recommended. Dolphin Discovery's activities and programs are very popular with cruise passengers and resort guests on both St. Thomas and Tortola, so make sure to make your reservations early if your heart is set on a particular program or activity. For more information, visit www.dolphindiscovery.com. Pack plenty of sunscreen. The sun is strong and direct, and it's easy for little ones to get burned. Make sure to reapply sunscreen often if you're out all day.